You’ve decided to let your horse go barefoot but are receiving conflicting advice on how to best manage him. You thought you could just have the shoes pulled and let your horse go, save for the occasional trimming. To help you skirt those unnecessary mountains, Taylor, along with Lisa Simons Lancaster, who is a DVM and farrier, and Jeff Ridley, a certified journeyman farrier, give you practical advice you can use. Dr. Lancaster, of Eden Prairie, Minn., is the author of The Sound Hoof: Horse Health From the Ground Up. She has also collaborated with Robert M. Bowker, VMD, director of Michigan State University’s famed Equine Foot Laboratory. 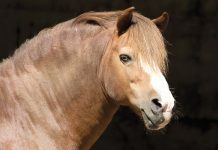 Ridley, of Leighton, Iowa, has earned the AFA’s Therapeutic Endorsement, a program that addresses strategies for horses with specific lameness problems. The most important issue is, can your horse go unshod? If health and conditions are such that hoof wear does not exceed hoof growth, the answer is yes. If the hoof wears down faster than it grows, then you’re either going to have to shoe your horse or alter the conditions that lead to excess hoof wear. live and work on the same surfaces: If a barefoot horse lives on soft bedding 23 hours a day and is then expected to work one hour a day on hard terrain, he’s probably not going to do well. But he might be fine if he works only in soft, even footing. have poor conformation: Taylor cites conformation examples including severe to extreme anterior or posterior and/or medial or lateral imbalance, angular limb deformities affecting fetlocks, knees or hocks, et cetera. “There is no sure way to know ahead of time if the horse will do well barefoot,” Dr. Lancaster explains. “Generally, owners curious about barefoot just go ahead and try it!” That said, prior to pulling the shoes, have your farrier or veterinarian examine your horse, as they might notice something questionable that you were unaware of. 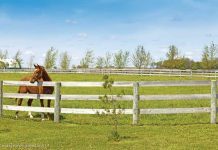 Numerous variables dictate how you will manage your barefoot horse, but here’s what you can expect. “I have not found any need for different angles or other trim parameters in horses to be shod compared to those left barefoot,” Dr. Lancaster says. Taylor agrees, as does Ridley. “Angles will remain the same, but the foot should be left a little a longer as it must maintain concavity, and vertical depth will be more conducive to staying barefoot,” Ridley says. Seasonal adaptation. 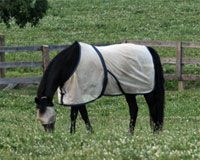 Your horse’s trimming schedule—and even his ability to go barefoot—could change with the seasons. For starters, hoof growth varies under different weather conditions. Seasonal changes can also alter the terrain, thus affecting the feet. Then, too, Ridley points out, a change in season sometimes brings a change in the work schedule, which, in turn, could affect hoof wear, trimming schedule, or the need for shoes. If hoof wear exceeds growth, it’s clear that the horse needs hoof protection and that may mean shoes. 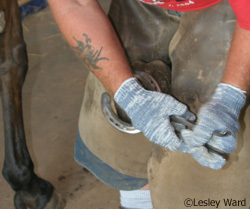 Before you decide to pull your horse’s shoes for good, consider his living and working conditions. Even after a horse adjusts, you may sometimes have to back off your schedule if hoof wear exceeds growth; reducing the horse’s work or training allows the hoof capsule to regrow to a comfortable length, important for protecting interior sensitive structures, Taylor says. Monitoring your horse’s hooves. “Wear on the hoof wall is the critical factor, in my opinion,” Taylor says. Watch for signs that your horse is beginning to react to too much wear or ground injury; signs include an unwillingness to move out, tender-footed or lameness, changes in his way of going, et cetera. Marcia King is an award-winning freelance writer based in Ohio. This article originally appeared in the November 2006 issue of Horse Illustrated. Click here to subscribe. Thanks for the article, mine is a barefoot horse, she always has been and seems to be doing well. It was very informative and interesting. Keep up the good work! The key to success for the horse – bare or with shoes is the trim. The problem is that many of the ‘professionals’ don’t know how to do that. 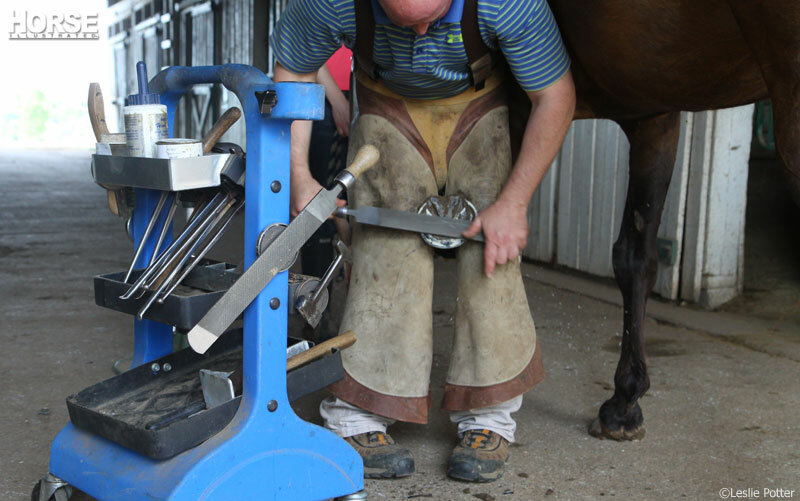 Many of the farriers in my area just focus on nailing the shoe on so it doesn’t come off, mainly at the expense of the horses long term soundness (ie small shoes, underrun heels, sometimes tall heels, etc). I would think bare foot would be better than that in most cases. At least then, the horse can try to maintain a decent hoof without it be stuck in a shoe. It seems to me that a significant element to success in the barefoot lifestyle for many horses is the use of hoof boots for temporary hoof protection. I wonder why this subject is not covered? Barefoot for many of us horse owners actually means barefoot and booted. why ask farriers about keeping a horse barefoot? They are thinking the old shoe paradigm, and it shows in this article. Extra hoof? This is the old paradigm talking, ie, the horse walks on the outer hoof wall only, which is just not seen in nature. And, check with your vet? Most vets poo poo the natural hoof care movement, at least around here. Don’t check with your vet, all horses should be without nailed on metal, that is not to say they should not be protected, the protection should be helpful and not harmful. Nailed on metal is no friend of the hoof, we’ve known this for a hundred years. Now we have better “shoes,” ie boots, that’s all. I trim hundreds of horses, I see excess wear extremely rarely. What farriers call wear, I call a nice bevel at the toe! Ask natural hoof care people, not farriers, when it comes to what to expect when removing shoes. It’s exciting to see this topic hit print. Perhaps it will open conversations not addressed within it. For example, all three professionals agreed hoof angles did not need to be discussed because they didn’t find any benefit to changing the angles. As a barefoot trimmer myself, it’s been a hurdle of mine to convince folks that their shod horses were unsound without shoes because of uneven pressures due to wrong angles. Most “wear exceeds growth” situations result because of incorrect angles which cause lack of circulation and excessive toe wear. Also, genetics and breeding play a small part, but consider the terrain you train an endurance horse in and you have the explanation as to why Mr. Emil Carre’s horse did so well barefoot. He traveled many miles over various terrains. This would naturally increase blood supply which increases hoof growth and integrity, and all the while crossing terrain that would naturally trim the hoof. The environment a horse lives in determines by far, the success of going barefoot. Just my $.02 worth and appreciated by the over 50 horses I regularly trim and leave barefoot. The thing is that when they say just try it.. They forget to say that you should be patient and only judge after half a year or so, because the hoof needs to adjust to a different position and that can even take over a year. So if after a month the horse is still not walking good, that does not mean the horse cant go wirhout shoes, it means the hooves are deformed because of the shoes and the living conditions. When going barefoot, you have to imitate the natural wear and that means trimming at least once a week!! And the hooves have to be trimmed correctly to go back to the natural shape. Often people dont know what that natural shape looks like and we are used to see deformed hooves, with high heels etc. and see that as normal, but that is so not the case… Barefoot only works if you undersstand how the hoof works and if youre not willing to inform yourself about natural hoofcare, find a natural trimmer that knows best. Farriers like to sell shoes even though shoes are the cause of many hoof problems and just make the symptoms go away. If your horse can not walk properly barefoot, there is something wrong inside, often caused by shoes or unnatural living conditions like being in a stable all day with soft bedding, bad diet etc. hooves are made to endure a lot! Wild horses can run over rocks etc. anatomy of all horses is the same. Every horse can go barefoot, if kept in the right conditions and with proper natural hoofcare. There are a lot of bad examples of natural hoofcare, and that is probably why it has such a bad name, but if you inform yourself and get involved in the trimmers work, a lot can be achieved with as a result a happier and healthier horse!! Never will i regret having my horse barefoot, she has the best hooves of all (shoed) horses at our ranch, but that is only possible with the right conditions and rright hoofcare. We only shod our horses in the summer and that was for 3 months then they were bare foot the rest of the time and they only got trimmed when they got shod and when the shoes were removed, we did that because we lived in Colorado where it snowed most of the year and the horses did better in the snow with bare feet. Good article in that even though three carriers were chosen to weigh in on barefoot issues, the slant of the article seemed to give the idea a chance. I disagree with some of the specifics on how a horses should be trimmed, but that is best left to the barefoot trimmers to debate. Also some great comments, although specifically to the commenter who said “don’t ask your vet”, why not find a new veterinarian if you don’t agree with yours? There are lots of us around and we have dedicated our lives to serving animals.